Athens International Airport is located 33 kms southeast of the city center and is accessible via Attiki Odos (the Athens City Ring Road). Public transport between Athens city center and the airport is provided by (a) express buses, (b) metro, (c) railway and (d) taxis. For detailed information, please see airport website. The symposium will take place in the building of the Department of Mathematics on the campus of the University of Athens (map), which is located in the district of Ilissia, about 3 kms east of the city center, between the municipalities of Kesariani and Zografou. All lectures will take place in the Great Amphitheatre of the building (its entrance is on the 2nd floor and will be clearly marked). The main gate of the campus is on Oulaf Palme Avenue (at its junction with Efroniou Street). Several public bus lines can take you from the city center to locations near the main gate. The terminals/stops of these lines (namely 220, 221, 222 and 235) are located in Akadimias street, on the northern side of the main building of the University of Athens. The most convenient line is 221, because it stops on Efroniou Street, near its junction with Oulaf Palme Avenue. However, buses of this line do not run very frequently, so it is advisable to prefer lines 220, 222 and 235, which stop on Michalakopoulou Avenue (near Hilton Hotel), from where you can walk to the main gate (7 minutes' walk). You can also use the metro: take line 3 (blue line) towards Doukissis Plakentias-Airport, get off at Evangelismos and then walk to the main gate, first along Vasileos Alexandrou Avenue and then on Efroniou street (about 15 minutes' walk). You can also use trolley lines 3, 8 and 13, stopping in Akadimias street at (a) Kaningos Square (near Hotel Residence Georgio) and (b) on the northern side of the building of the National Library. You should get off at Evangelismos and then follow the route described above. 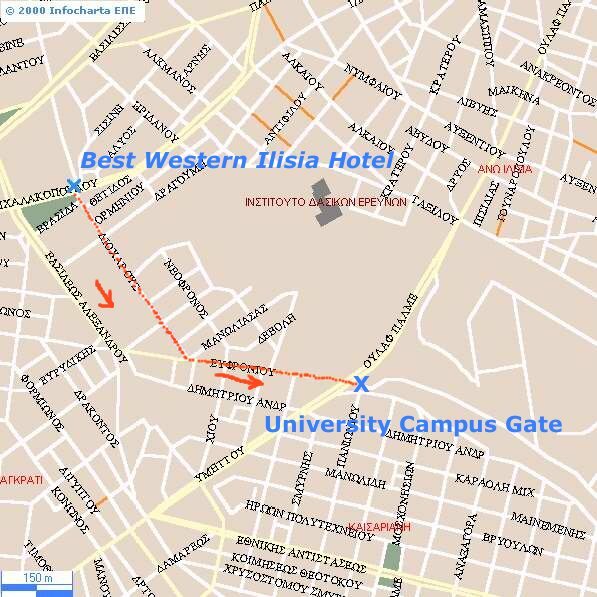 You can walk from Ilisia Hotel to the main gate of the campus following the directions of the map. Having reached the main gate of the campus, take the free coach that runs regularly round the campus between 08.00 and 20.00 (departure times to be announced), get off at the 5th stop and walk back 100m to the entrance of the building of the Department of Mathematics (the stop is opposite the entrance of the Department of Geology). Note that the main entrance of the building is marked with "ΤΜΗΜΑ ΜΑΘΗΜΑΤΙΚΩΝ".